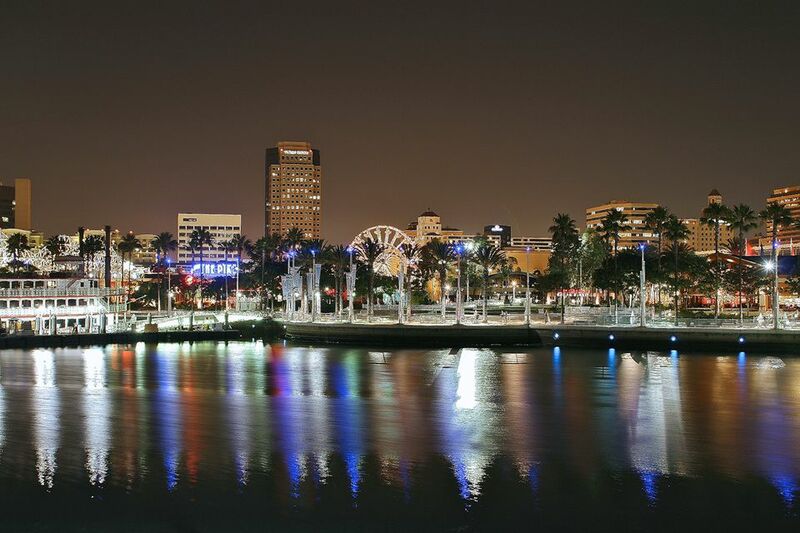 Downtown Long Beach is a popular destination for locals and tourists alike who want to experience a more laid-back part of Los Angeles nightlife. Featuring plenty of bars, clubs, and restaurants with music from a variety of genres, Long Beach has become one of the most popular neighborhoods in the Valley for weekend getaways and nights out on the town. Most restaurants, bars, clubs, and live music venues are located along Pine Avenue from 4th Street (with regularly scheduled party buses) to the Pike and Shoreline Village, but a few destinations lie closer to the beach itself. If you're in the mood for a bit of Latin flair, Alegria Cocina Latina is a Spanish and Latin American restaurant and bar with flamenco shows Friday through Sunday and live Latin fusion bands between each set. There's enough dance space for four couples to hit the floor comfortably, but that doesn't deter large crowds from squeezing onto the dance floor when the music's good. You'll also find indoor and outdoor patio seating and an extensive menu of drinks and tapas from Mexico, Spain and Latin America including sangrias and mojitos specially concocted in-house. With three locations in California and a new one expected in Santa Ana by early 2019, the Congregation Ale House Chapters offer visitors several opportunities to sample the California-brewed Congregation Ales. In Long Beach, the popular church-themed pub features stained-glass windows, lots of interesting beers on tap, and good food at the corner of Broadway and the Promenade. Congregation Ale House also features a take-out menu seven days a week starting at 11:30 a.m. daily and lasting through 10 p.m. or 11:30 p.m. at night. Along with typical gastropub fare like hot wings and chicken strips, you can also sample some California specialties like grilled artichoke, chicken cobb salad and a carnitas pizza. If you're looking for an authentic Irish pub on your trip to Los Angeles, Auld Dubliner offers an escape to the Emerald Isle right in the heart of Long Beach. The scene here evolves from after-work happy hours to conventioneers and locals alike stopping in for a hearty Irish dinner to late-night college dance parties packed with tourists. Auld Dubliner Irish Pub also features a fun mix of local Irish and non-Irish musicians that play late into the night. Check out the calendar of special events, especially for the annual Oktoberfest and Saint Patrick's Day celebrations, which are among the best in Long Beach. Located right under the Congregation Ale House at the corner of Broadway and the Promenade, Harvelle's is an underground live music venue whose sister location in Santa Monica is the oldest live music venue on the west side of Los Angeles. Along with nightly drink specials, you can also catch comedy sets, burlesque shows, boudoir photography sessions, and greaseland rockabilly performances most nights of the week. Some people refer to Shannon's on Pine as a dive bar, but it's more of a local hangout that just happens to also be cash-only. Many downtown Long Beach residents gather here to watch weekend sports on the many TVs over a reasonably priced beer and a burger, rather than a trendy tourist spot, so if you're looking for a more local experience, head over to Shannon's instead of one of the other venues on this list. If you're in the mood for a venue that's slightly more upscale and classier than your standard music club or bar, District Wine is a trendy wine bar and gourmet beer club in the East Village Arts District of downtown Long Beach that's perfect for a quick bite, some nice live music and some of the best vintages from nearby wine country. The food menu includes large and small bites with an emphasis on French and Italian cuisines, and area favorites include the District Margherita flatbread, pinot braised pork belly appetizer, and seasonal soups and salads. District Wine also features a daily happy hour with special prices for most menu items including some specialty wines and beers. Although considered a micro-chain, Tequila Jack's Restaurant and Cantina in Long Beach offers waterfront dining and drinking at the Shoreline Village and is more of a restaurant than a club or bar. However, they are known for their enormous margaritas and weekly happy hour specials that are sure to get your night started off the right way. If you're in town mid-week, stop by for Taco Tuesday or for TJ's luncheon specials, and if you're looking for a spot to take a date, the candlelit outdoor patio with views of the Rainbow Harbor and city skyline are sure to set the mood before you finish off the night dancing to some live Latin music upstairs. At Sevilla, you can have dinner with a flamenco show, followed by dancing on a postage-stamp-size floor to a live Latin band, then head upstairs to bust a move with a DJ and go-go dancers in the main club. Whether you're enjoying a quick bite at the Café Sevilla or hoping to catch one of Long Beach's best Latin-inspired DJs at the Sevilla Nightclub, you're sure to enjoy this trendy spot on Pine Avenue. Café Sevilla and the Sevilla Nightclub also have locations in San Diego and Riverside, but the Long Beach location features nightly events, weekly drink specials, and a VIP experience unlike any other venue in the neighborhood. This slick Asian-fusion restaurant and bar offers tasty food and drinks and a decent happy hour on weekdays. Although the bar scene here tends to run a little bit more professional and older than other venues on the list, it makes for a great place to toast the evening with some sushi and sake before heading out to the nearby music venues for dancing. Wokcano has multiple locations in and around Los Angeles, including in Burbank, Cerritos, Culver City, Santa Ana, Santa Monica, Topanga Canyon, Tustin, Valencia and West Hollywood. Whether you're in the mood to eat, dance, or sample some of the best microbrews in Los Angeles, the Rock Bottom Brewery is anything but the bottom of the barrel. This microbrewery, bar, and restaurant makes each beer in-house and never allows the product to sit in storage for longer than a few days, guaranteeing the freshest of home brewed beers you'll find in the city. The food menu contains both bar favorites like hot wings and ballpark pretzels as well as classic entrees like steaks, bacon chicken mac and cheese, Creole salmon and even tacos. Brewery events and specials happen on a weekly basis, so check out the official website for up-to-date listings on the latest microbrews and brewery events.